A note written by Boston Marathon bomber Dzhokhar Tsarnaev as he hid inside a boat contained themes of global jihad similar to those found in extremist materials on his computer, a terrorism expert testified Monday at his federal death penalty trial. 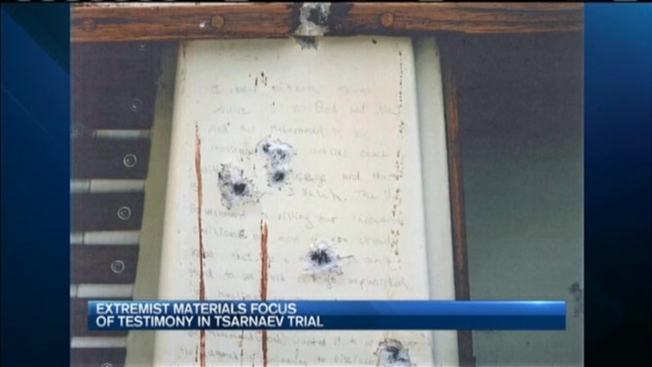 In the note, scrawled in pencil and carved in wood on the inside walls of the boat, Tsarnaev condemned U.S. actions in Muslim countries and asked Allah to make him a "shaheed," a martyr, said Matthew Levitt, a terrorism expert at The Washington Institute, a think tank that focuses on U.S. policy in the Middle East. Levitt said many of the ideas included in Tsarnaev's note are contained in lectures by Anwar al-Awlaki - an America-born Muslim cleric suspected of being a terrorist and killed in a U.S. drone strike in Yemen in 2011 - and writings in the al-Qaida publication Inspire magazine, both of which were found on Tsarnaev's computer. In one Inspire article shown to the jury, titled "Make a Bomb in the Kitchen of Your Mom," the instructions say a pressure cooker "should be placed in crowded areas and left to blow up" and "More than one of these could be planted to explode at the same time." During opening statements, Tsarnaev's lawyer acknowledged that he participated in the bombings but portrayed Tamerlan, 26, as the mastermind who recruited his younger brother, then 19, to help him. Tsarnaev's lawyers have made it clear they are using both the guilt and penalty phases of the trial to try to save him from the death penalty. Prosecutors are expected to rest their case in the guilt phase this week. The same jury will then decide whether he spends the rest of his life in prison or receives the death penalty. Levitt, testifying for prosecutors, said the themes in Tsarnaev's note are common in the global jihadi movement. In one part of the note, Tsarnaev wrote, "We Muslims are one body, you hurt one you hurt us all." "It's the idea that if you hurt one Muslim in any part of the world, it's incumbent upon a Muslim ... to do something about it," Levitt said. Levitt was expected to be cross-examined Tuesday by Tsarnaev's lawyers. 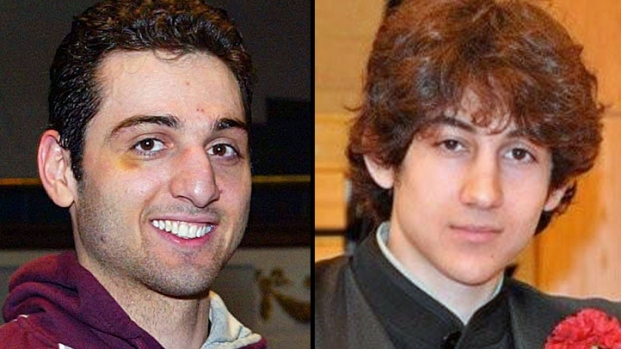 Investigative Reporter Susan Zalkind discusses her exclusive reports on the Tsarnaev brothers for The Daily Beast. Earlier Monday, one of Tsarnaev's lawyers aggressively questioned an FBI agent about extremist materials found on Tsarnaev's computer as the defense attempted to portray Tamerlan as more radicalized and primarily responsible for the 2013 attack. Kevin Swindon, a supervisory agent in charge of the Boston FBI's cybersquad, last week described a variety of extremist content found on Tsarnaev's computer. During cross-examination Monday by defense attorney William Fick, Swindon acknowledged that Tamerlan Tsarnaev's computer had encryption software on it, but Dzhokhar's computer did not, an apparent attempt by the defense to suggest that Tamerlan had something to hide. While questioning Swindon, Fick also suggested that much of the activity on Dzhokhar's computer centered on Facebook and other subjects of interest to teenage boys, including popular music and homework. As part of one of his questions, Fick said there was nothing about "jihad" or "Islam" among the top search terms on Dzhokhar's computer.